Two posts on one day---do you believe it? Don't miss the last post down below this one. In November I have several things happening. I will have a booth at the juried Daly Mansion holiday craft show and have been working on lots of new small pieces for that. My booth will be on the second floor. This is my first experience with this kind of selling, so I'm a bit nervous about how it will go. Whether I sell much or not, I will definitely enjoy finding out how people react to my work and what they think of it. It is three days so I'm hoping I'll make a few sales and have fun talking with people about what I do. I will also have some work in the "Many Faces of Fiber" show at The Artist's Shop in Missoula, Montana. There will be some quilted table runners by Judy Hartz, some weaving, wearables and I'm not sure what else, but I know it will be a very interesting show. This is a wonderful coop gallery that is worth visiting, particularly if you are looking for gifts for the holidays. I highly recommend it. I will also have work at The River's Mist Gallery where the featured show in November is Master Woodworkers. I think my fiber art goes particularly well with wood, so I'm hoping there will be room for a few to hang with this show. I will likely have "Jewel of the Forest" there so if you want to see it in person please stop by. The gallery is on Main Street in Stevensville. In December River's Mist Gallery will have work by all of her featured artists, including me. Look for more of my small pieces perfect for holiday gift-giving if they don't all sell at the Mansion! As always I will have some work at Art City and The Frame Shop which are both on Main Street in Hamilton, Montana. 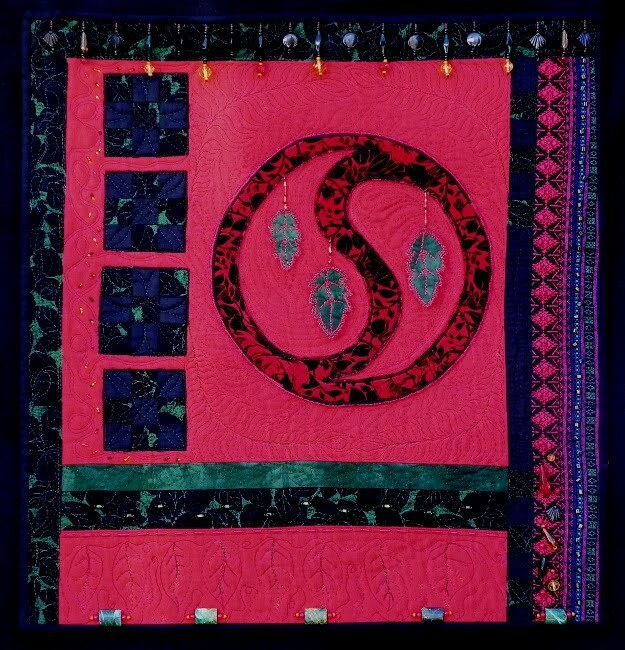 This weekend my mother and I will be headed to Spokane, Washington for their quilt show. I have three pieces entered and I'm looking forward to seeing the show. I have heard this is a very nice show and I'm sure they will have a lot of vendors where I can spend some money! Before I get to my rejected Quilt National quilt, I have some other news. My quilt, "Blackberries and Dandelions" will soon be shipped off to the Art Quilts XV: Needleplay exhibition in Chandler, Arizona (near Phoenix) for a show that will be up from November into January. This is my first gallery art quilt show and I'm very excited about it. Sure wish I could be there to see it. Also, I had one piece, "From Winter We Emerge" at the Innovations 2010 show in Tacoma, Washington and it won Judge's Choice and a Peer Award there. Then this past week I had a phone call telling me that my quilt, "Red Sky", won third place in the Fiber Art category at AQS Des Moines!! That is my biggest award yet and has a nice cash award attached to it. Maybe I'll finally get that digital camera I've been hoping for! Now on to the Quilt National story! This year I finally had a piece that I felt might be worthy of Quilt National so I submitted an entry. Unfortunately it did not make the cut, so now I can share it with you. This was a truly inspired piece and it created itself as it was made. I didn't know what I was going to do with the tree trunk when I made it. The piece evolved around it. The fabrics on the left and right sides of the piece are my rusted Osnaburg which was wrapped around a large rusty chain. I painted the fabric that the tree trunk is on with fabric paint. The remaining fabrics are commercially made, including a hand-made marbled fabric (not by me). The tree is made of molding paste that has been colored with PearlEx powder and then put onto the fabric with a palette knife. It was then painted to give it some highlights and shading. I knew that something needed to be added to make the trunk more interesting and I spotted some coated wires about the right gauge. They were each less than 8" long and I had maybe a dozen of them. I found a wonderful multi-colored rayon flat ribbon in my stash and started winding lengths of it around to cover the wire and then left about 4" dangling at the end. When I held these up to the quilt the dangling ends just hung limply and it appeared that I needed to do something more. Of course then I thought of using beads and collected some that went with the piece and started stringing them in random "pattern" between loops of the ribbon (see pics). It worked wonderfully and the weight of the beads was perfect for the strenth of the wire. I securely stitched the ends of each wire to the top of the trunk so they would extend out from the wall and curve gracefully, draping like willow branches. They bounce ever so slightly when you walk by or if there is air movement in the room.